SewCat has grown quickly: now with dealers in 70 countries around the world SewCat has among the largest distribution network in the industry. 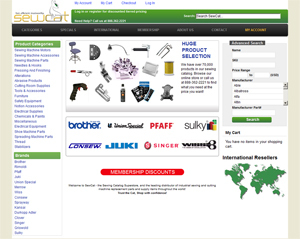 SewCat's new online store provides direct end-user sales support and global shipping. In addition you may order locally from the 70 countries that we support. Please note that pricing internationally will not reflect the online posted prices. Click here to visit www.sewcat.com now! Why Buy From SewCat? Here are four of the main reasons we are confident you will become a lifelong shopper at SewCat: 1. Selection - We have the largest selection of products in the largest variety of categories on the web. In addition to being the largest retailer of sewing products online, did you know that we also offer everything from sewing machines, thread, scissors, lights and more? And it's easy to find exactly what you want among our hundreds of choices with only a few quick clicks. Can't find what you want? Call or email us. 2. Low Prices - We comb the web to make sure our prices are the lowest anywhere. If you see an item for less, email us. We can get you a better deal almost every time. We are proud to help you save money on the products you want. 3. Service - Whether you are thinking about buying, or you have already made a purchase, our knowledgeable sales and service staff is only a phone call or email away. We're here to serve your needs. Give us a call! Our team is available from Mon-Fri 8am-6pm, to get you the answers you need. 4. Quality - We sell merchandise from the top manufacturers in the world, from Merrow Sewing Machines to Wiss Scissors to Hirose Hooks. We stand behind the quality of the products we sell, which is why we provide you with helpful Quality Ratings for many items on our site, and will replace any item that you receive that is not 100% as described.